We offer an extensive selection of beads, semiprecious stones, pearls, swarovski crystals, murano , silver, and beading supplies. Check our own handmade designs of bracelets, necklaces, pendants, earrings made of swarovski crystal, murano and semiprecious stones. 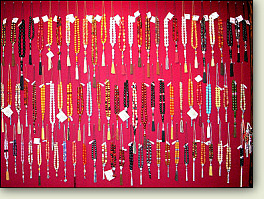 Worrybeads made of amber, faturan amber, bone, horn, olive wood, ebony, semiprecious stones and silver - see a sample display above. Lucky charms for your house, car, and to protect you from evil.